Fantastic 3D Caves In Only 10 Minutes! 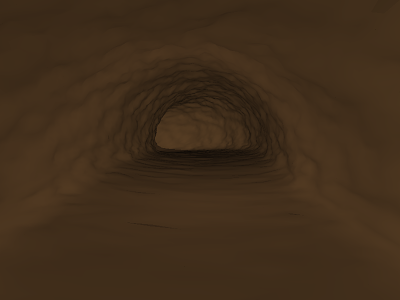 I made a test piece of track to see if I could get the process down for making good looking caves. It was way easier than I thought and produced fantastic results. 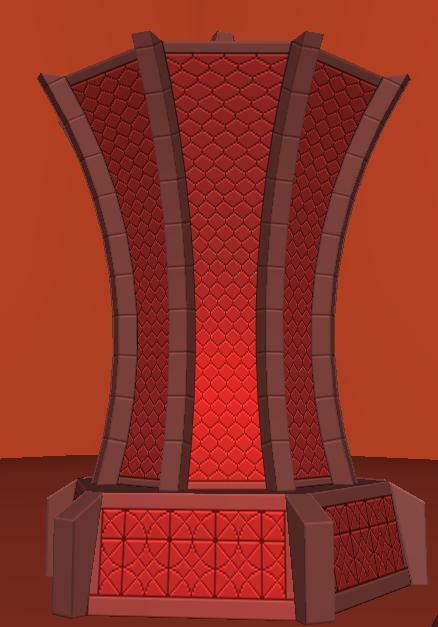 And the best part is I did it with no textures at all! A simple and easy to make cave. It was easy to make and the process is simple. I took a cylinder and cut off most of the bottom half of it. Then extruded it several times and angled the joints correctly. 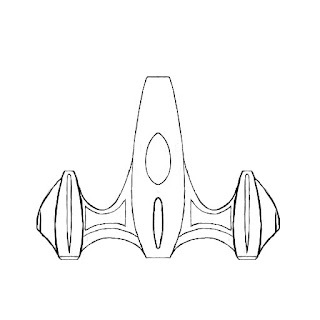 Then I smoothed it once, and hollowed out the center with a simple command in Wings 3D. I hid all the parts I didn't want to work with and selected all of the horizontal lines of the inside of the cave, then cut them all into 4 parts and connected all the dots. This makes pretty much all of the polygons more or less square instead of really long rectangles. I then hid the floor since I wanted it to turn out more smooth than the walls. I then use a command to select 20% of the edges of the cave walls and moved them all a little bit to make the cave look more rough. 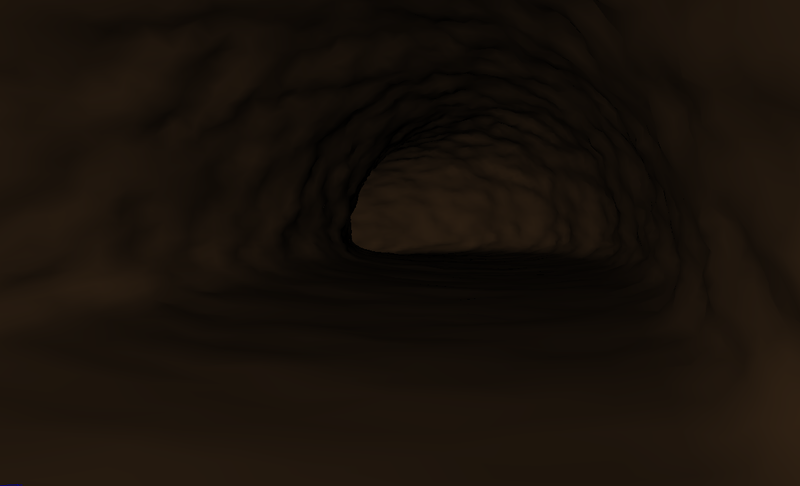 I then smoothed the cave walls again. After that all I had to do was unhide the floor and select 20% of the vertices and move them a little bit. This made the floor look a little more natural. It looks pretty great and the polygon count isn't as high as I thought it would need to be. With todays average hardware a computer can be expected to display at least half of a million polygons at once. There is even a scene in Oblivion that shows nearly two million, and my computer never even skips. The simple piece I made is larger than the player will usually see at once and is only about twenty thousand polygons. Of course I'm not going to make anything like this in an outside setting, but for a tight corridor this really works well. I finally decided to work on my game again. Here is a picture of a completed racing vehicle. I decided to use only material colors on it so the player can customize the colors very easily. There are four customizable colors on this racer. 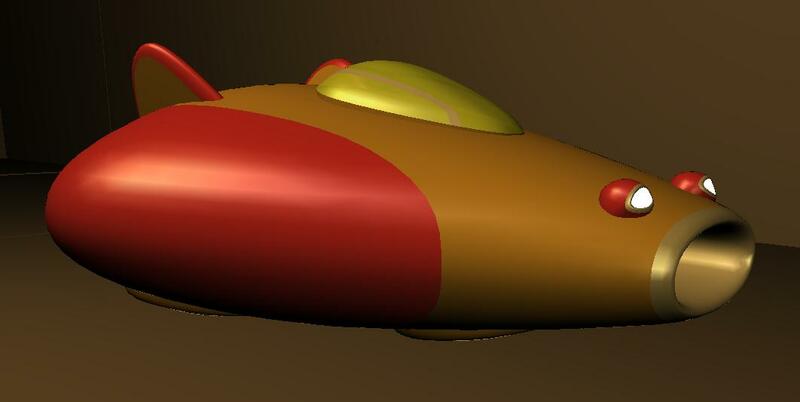 The two primary colors of the racer, a single color for the cockpit, and a metalic color for the details. It kinda looks like a mouse head if you look at it the right way. I'll call that an unintentional cute side effect. Some of the racer designs will look like animals intentionally, like the sea turtle racer I designed a few months ago. A fancy new racing vehicle! One thing I really enjoy is when a game can pull off a good atmosphere. I strongly believe the best way to do that is with good lighting. In this case I plan on having a lot of dark places in tracks where you would depend on your own headlights. But also a great feature would be to have tail lights too! Of course the most important lighting will be proper lighting of the levels. This racer even has headlights and tail lights! 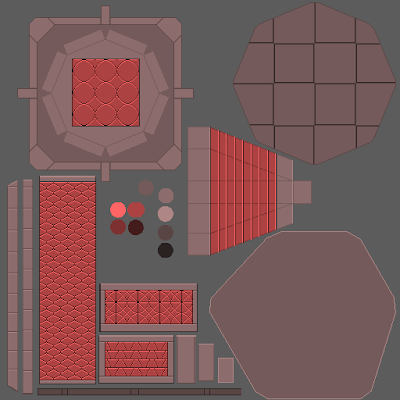 Unfortunately because of time constraints and lack of intense will power I will probably be relying intensely on material colors for most assets and use very few textures. But this makes good lighting much more important. If its done right I can still make the game look fantastic with very few textures. I will likely have to use a lot of textures on the race courses though. 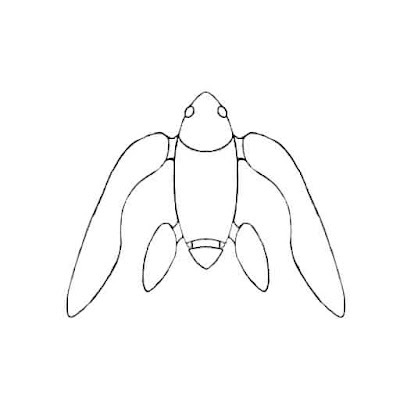 The design for the Sea Turtle Racer I mentioned earlier. I may need to redesign this Sea Turtle Racer a bit though. I think its arms turned out way too large and its midsection way too skinny. But its a neat first draft and something fun to think about. Finished Models for Earth and Mars! 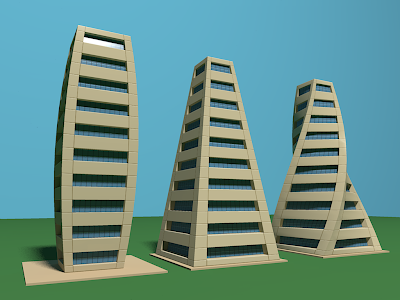 I've got more buildings done! I tend to pull my inspiration from anywhere I can find any. 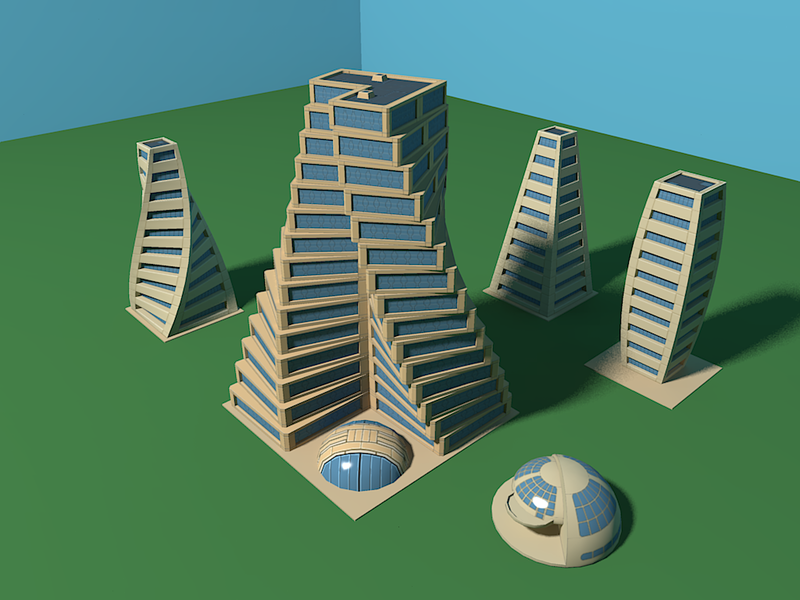 For instance the large twisted building is based off of a building in Sim City 2000 Gold edition, only available in a futuristic texture pack. The Large Twisted Apartment Complex was made with 19 pieces. I started by modeling the first floor and then I textured it. Afterwards I copied it 14 times and shrunk each floor a little more than the previous floor. Then I rotated the floors to give it a twisted look. I also experimented with UV mapping tecniques with the dome which allowed me to make a dome shaped house you can see on the bottom right. 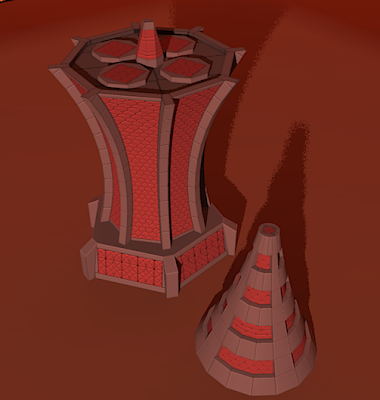 I have also finished a couple models I plan to use on Mars! The larger building is the corporate headquarters of Mars Manufacturing, the biggest company on Mars and one of the manufacturers of the parts and upgrades the player will be buying or winning throughout the game. The player will also be able to win them as a sponsor to recieve bigger rewards from winning a race and possably a discount on their parts. The building is kind of crown shaped and is larger at the top than at the bottom which will make it look like it is towering over you and is an impressive sight to see. I may change the name of the company to something more edgy later and give it a marketing campaign so players may see their advertisements in the game on bilboards or on jumbo TV's. Its looking quite fantastic! I would have to say the art style is about solidified. It takes about 8 hours to make a building from start to finish because I make the texture by hand in a pixel art style. Here is the texture for Mars Manufacturing. I used some tricks to make the curvy parts straight on the UV map. I also make all the faces that are the same shape use the same part of the texture. I took some time today to UV map and texture a building. Afterwards I transformed it into a couple other buildings so I could reuse the texture. Honestly I am quite impressed with how it came out. I really didn't think it would come out so well half way in. The texture is very simple and resembles line art or pixel art. Putting in small highlights in the right areas really made it all come togeather. 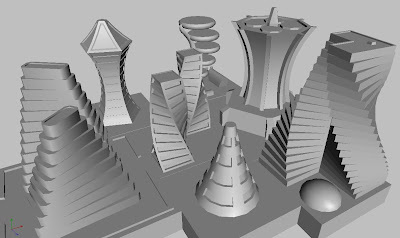 Many futuristic buildings were modeled by RemixedCat and I today. We went wild just playing around with neat building shapes and kicked ideas around all day. I would have to say it was all quite fruitful! We came up with a pretty good style and the buildings we modeled look great! Usually what we do is model most of the assets and come back and texture the ones we decide to use. So I will show some textured buildings later when we hit that step. Its been a long long time since my last post. I also haven't worked on my last project any since October. I bought a house in November and I have finally settled in. So lets get things going again! My project "Lost Kingdoms" has pretty well stalled and for now I would consider it too ambitious so I'm going to put it on the back burner for now and after I complete a smaller more fun project I may either come back to it or cannibalize it for a better thought out project. So what will I do instead? Glad you asked! I'm going to jump into a niche market and make a racing game! No not one of the thousands of NASCAR games or even anything with wheels. This racing game is going to be set a few hundred years in the future with hovering cars and races all over the solar system! In my opinion there are a few good elements that make a good racing game. First obviously is the feel of the racer, it has to be responsive and fast! The second element I like is being able to buy upgrades, it makes wining more important because your after the prize money. Third is the game's graphical style, I'll have to whip out some fun and funky graphical elements and make sure I throw some awesome on it! Mmm yum, its awesome, and tasty! 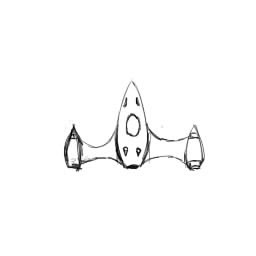 Generally I am drawing some of my inspiration from what I would consider the best racing game ever made, "Star Wars Episode One Pod Racer" for the Nintendo 64. Sure there may be a couple newer games that are similar and passably better but I haven't played them myself. But some of the feel of a super fast race and the general idea that you can upgrade your racer are all I'm borrowing from it. And honestly I plan to expand upon the customization greatly. The player will be starting out with a junky or old car and they will start their racing career in an amateur circuit. The player will have to race a bunch of races and a small tournament in order to progress to better races, possibly with better paying sponsors and more fame and riches. 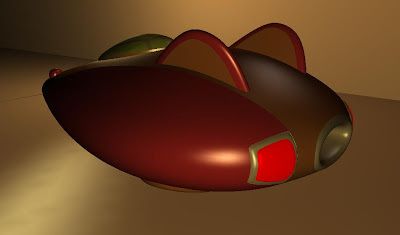 And they would have to upgrade their racers and buy better hovering cars in order to compete. That part is all pretty standard in a good racing game but there could be a lot more. Such as running around great cities finding black market dealers to buy more unique parts, or occasionally running a crazy delivery mission through the Volcanic regions of Io, one of Jupiter's moons. So I plan to make a few unique twists on an already interesting game idea. Since the first phase of planning is done, I have actually been able to get some work done on real assets! Here are the pics for one of the racers. I still have yet to texture it however, but you can see what I started with and how it ended up. I started with a quick basic sketch just to get the general shape on paper. I made a bunch of these and only pick the ones I like to continue working on. I do all my drawing with a graphics tablet in "Easy Paint Tool SAI". After I pick a good sketch to work with I blow up the sketch and on a new layer I draw over it, refine the shape and edges, then add detail. Some of the ideas and detials I rethink by the time I make the model however. Finished 3D model ready for texturing, or a paintjob. And here is the finished model that just needs some paint slapped on it. This particular ship took about 12 hours to model, mostly because I had recently learned some new things about 3D modeling and I took the time to play around with my new knoweldge. Otherwise all the complicated shapes of the wings and fins took a lot of trial and error before I got them how I wanted them. This model was a lot of fun to make and I learned a lot from it. And best of all, the model is unsmoothed, I did it all by hand and didn't rely on subdivision to hide any blemeshes. After triangulation the model weighs in at approximately 5300 polygons. I even made all the movable parts like the rudders, landing gear hatches, and cockpit hatch fit into or on the model seamlessly. 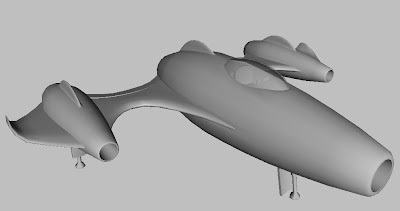 I plan to have all of those parts animated in the game, and also a lower poly character in the cockpit too. I will likely make several models before I decide how I want these painted though. I would like to offer the player some options such as color selction so I may make a few neat textures that only rely on 3 or 4 colors and alow the player to change the colors. So besides just a plain ship, the player could throw on a flame themed texture set on the ship, and change its color scheme too.